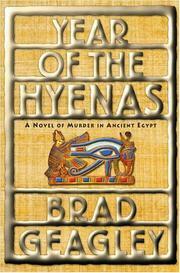 A debut historical mystery about foul play among the Pharoahs. The time: 1153 b.c., some thousand years before Cleopatra. All hell is about to break loose in the city of Thebes, and an embittered, self-loathing, near-alcoholic named Semerket will be its reluctant instrument. The Clerk of Investigations and Secrets is a cop charged with nailing the killer of beloved local priestess Hetephras. The job is tough and success is actively discouraged. Semerket learns soon enough that responsibility has fallen on his shoulders precisely because the powers-that-be expect him to collapse under its weight. But despite his serious character flaws, despite his deplorable private life, Semerket is a prototype of the crime-sniffing bulldog with personal issues. In western Thebes, he discovers a gang of bold tomb-robbers. Could they somehow be connected to the murder of the priestess? As Semerket pounds Theban streets in pursuit of Theban thieves, he begins to squirm with anticipatory dread. What he’s in the middle of is not just brazen larceny, not just a straightforward case of brutal murder, but a gigantic conspiracy endangering both the Pharoah and the woman Semerket loves.